Step 1: What Process ? The first decision any buyer of custom sport or academic medals needs to decide is the manufacturing process. We offer two ways to make your medals. This process is typically reserved for customers who want a very "high-end" looking medal. We've made this product for national and international events mostly. In the event you want paint on your medals, you'll need to decide between Hard or Soft Enamel. Approximately 95% of the medals we sell do not have paint. This option is desirable for customers who want to add tournament or event branding to the ribbon. We use the same ribbon material as above but silkscreen your text on the ribbon. 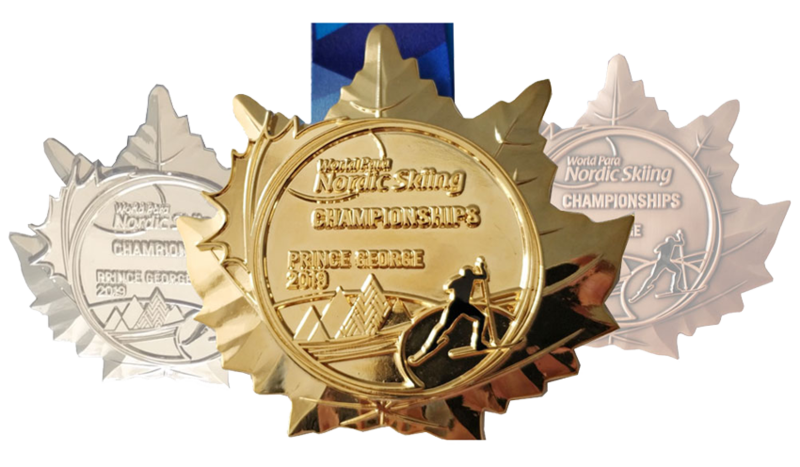 Example "2019 World Championships Toronto"
This is the best option for customers who require multiple colours on a ribbon or complex art. This process uses inkjet printing technology to dye sublimate the fabric any colour. There are two ways to attach your ribbon to the medal. The Slot Loop is perfect for most applications. It allows the ribbon to sit flat on the recipient. Each ribbon is sewn first and attached second. The Jump Ring loop is another way to attach clip-on ribbons to medals. Do you require engraving on the back? 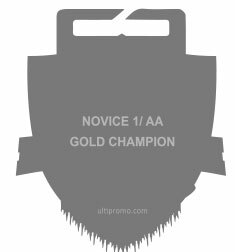 If so we offer three ways to add text to the back of your medal. Laser Engraved: The text is rendered with laser engraving on the back. Silkscreened: We add coloured text to the back. This is great for customers with mulitiple divisions or catagories. Design can take anywhere from 1-6 weeks depending how developed your design ideas are. We need time to make your design "medal friendly" so budget 3 working days if its complex art. Manufacturing time can take anywhere from 2-4 weeks. Most orders take around 2-6 months to complete from the time you talk to us and the time your medals arrive. If your design is "good to go" and your order stock ribbons. Our design department has created thousands of medals. Design services are free of charge. The vast majority of medals that cause us manufacturing issues are due to design challenges. Graphic designers need to understand the 3 dimensional nature of our product and how to utilize metal finishing techniques. We strongly suggest showing your finished design to suppliers for feedback before committing to the design. Use dynamic shapes: stay away from circles and squares if possible. You are paying for a custom medal so don't be afraid to have elements protruding from the edges or use 3D elements in your designs. Remember to use raised metal area. Text is almost always rendered in raised metal. Lines and shapes need to be separated into layers. Reduce your art to actual size and print it out. Most designers submit art at 3-4x scale. When reduced we encounter areas for enamel that are too small. Text in UPPERCASE is usually best. Text is often too small at scale to hold colour. Make the text metal for best results. What size should I make my design? What are my choices for metal finishes?